NutriFiber is a forage grass technology, available in select Barenbrug grasses, that helps modern dairy producers by providing physically effective, digestible fiber for today’s high producing cows. Today’s high-producing dairy cows require both Non-Fiber Carbohydrate (NFC) and Neutral Detergent Fiber (NDF). Properly balancing NFC and NDF is critical for animal health and profitable production. Table 1 below presents ration guidelines. Commonly formulated rations frequently contain too much NFC and too little highly digestible, physically effective fiber. Unlike commonly utilized feedstuffs (Table 2), NutriFiber is ideally composed to properly balance high energy rations for today’s high-producing dairy cows. Ruminants fed a diet high in water-soluble carbohydrates (sugars and starches) from grain and other feedstuffs can suffer in a number of ways. A lack of highly digestible, physically effective NDF (peNDF) plus an excess of rapidly fermenting grains and sugars can cause chronic lactic acidosis in dairy cows and other ruminants. Issues such as hoof problems, milk fat depression, high cull rates, transient diarrhea, unexplained death loss, clostridial infections or liver abscesses can be caused by Subacute Ruminal Acidosis (SARA). Forages low in Neutral Detergent Fiber Digestibility (NDFd), such as mature alfalfa and grasses, corn stalks or even wheat straw, will provide fiber but can limit feed intake due to slow passage rate. The NDFd of commodities like corn gluten feed and beet pulp are high, but their total NDF content is relatively low and their NFC content is high (see Table 2), making it difficult to achieve the ration target shown in Table 1. Soy hulls do contain a relatively high amount of NDF that is highly digestible and have a low content of NFC, but they are low in the physically effective NDF (peNDF) that cows need for cud chewing and proper rumen function. time that NDF is a measure of the “bulky,” slow-to-digest feed component. The higher the NDF value, the less an animal could consume and the lower the forage quality. Some forages, such as cool season grasses, have higher NDF content than alfalfa, and have been considered lower quality as a result. This, it turns out, is an over-simplification. The truth is that NDF values cannot be compared between forage species. Not all NDF is created equal. Optimizing forage utilization by dairy cattle requires knowledge of the NDFd and the rate at which it digests. Relative Feed Value (RFV) has been widely used to rank forages for pricing, harvesting and allocation of forages to different groups of animals. It was largely influenced by Acid Detergent Fiber (ADF) and NDF values. Relative Forage Quality (RFQ) was developed as an improvement on RFV. The RFQ value incorporates digestible fiber, making it a better indicator of how an animal would perform on a given forage. But a basic limitation of RFQ is that NDF values from alfalfa, corn silage and grasses cannot be directly compared. The Total Tract Neutral Detergent Fiber Digestibility (TTNDFd) index developed at the University of Wisconsin is a new tool that permits comparisons of fiber analyses from different forages. The TTNDFd provides better predictions of milk production from fiber analysis and shows that NutriFiber forages supply higher energy due to their high fiber digestibility. This new forage quality assay can also be used in developing new varieties as a selection criteria in breeding programs. 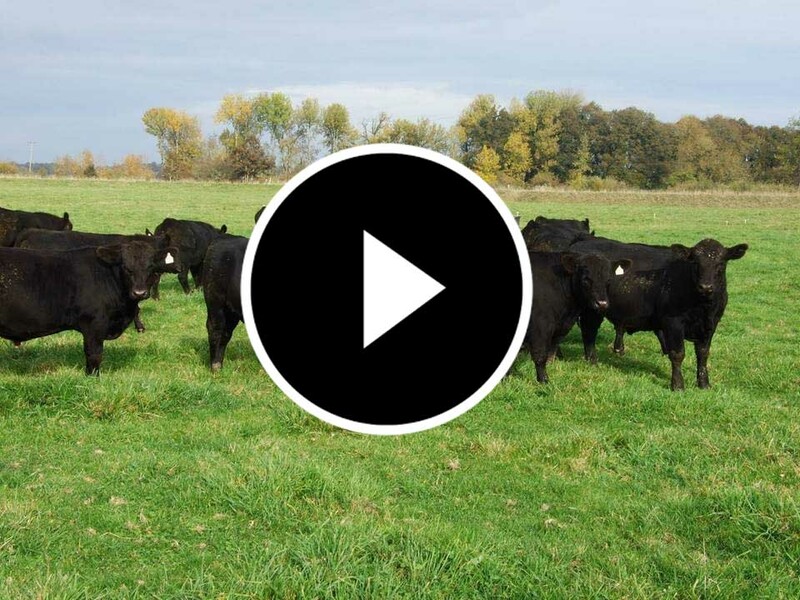 The NutriFiber mark is your assurance that your forages have the highest genetic potential of producing the highest TTNDFd ration forage components for your high-producing cows. The graph below shows the variation of digestibility in forages. NutriFiber forages range between 60-80 TTNDFd (% of NDF). Less than 40% TTNDFd represents poor digestion and over 50% TTNDFd represents excellent digestion. Rumen acidosis is a metabolic disease of cattle, occurring when the pH of the rumen falls to less than 5.5 (normal range is 6.5 to 7.0). Like most metabolic diseases for every cow that shows clinical signs, there will be several more which are affected sub-clinically. The primary cause of acidosis is feeding a high level of rapidly digestible water-soluble carbohydrate. Acute acidosis often results in death. A milder form, called Subacute Ruminal Acidosis (SARA), is seen in dairy cattle. Feeding NutriFiber forages, with more digestible physically effective fiber than wheat straw, can help to reduce acidosis. 1. Acute and Subacute Ruminal Acidosis, Dr. Clell V. Bagley, D.V.M., USU Extension Veterinarian. 2. Acidosis, Rick Stock, Extension Feedlot Specialist and Robert Britton, Ruminant Biochemist, University of Nebraska. On average 50% of milkfat is made from short-chain fatty acids, specifically acetate and butyrate. These are primarily made in the rumen from the fermentation of fiber. Adding NutriFiber to the ration increases the digestible fiber that produces these substrates for milkfat production. A study conducted at the University of Wisconsin replaced equal portions of corn silage and alfalfa silage with NutriFiber silage.The resulting treatment ration contained 2% more NDF and 2% less NFC (of the ration dry matter). Small changes can produce big results. During the first period of the test, cows on the treatment diet produced milk with 0.5% higher fat test (3.5 more pounds of 4% Fat Corrected Milk per day), a statistically significant effect. After 2 months, the treatment and control groups were switched. The effect of switching diet was pronounced. Removing NutriFiber silage from their ration reduced fat test by 0.35%. Adding NutriFiber silage increased fat test by 0.35%. A clear demonstration of the value of NutriFiber!